I came to geography late through sociology. I always felt that there was a crucial element of knowledge missing in my sociological understanding of the world. It turned out that this missing piece was space. Sociologists talk about space but only geography provides a rigorous theoretical unpacking of space and all things spatial. Strange then maybe that I found the best exposition of the spatial and the religious in an anthropology book. 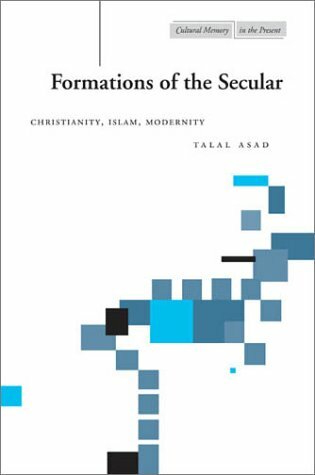 Asad’s Formations of the Secular provides one of the most powerful and compelling cases for a relational geography of the religious and the secular. Written as a series of essays, it introduces several important ideas about the social expression about the religious and the secular. I found his approach vital to my own doctoral research. From an Irish perspective in particular, Asad provides a way out of the analytical dead end within which a normative European model of secularisation revolves. This way of looking at the public sphere means that it is not merely the background of the people engaging that matters but the very notion of what gets counted as ‘background’ and ‘foreground’ as political principles. To me, this means that many academic understandings of the public sphere rely on an idealised subject. This way of thinking about secularisation involves a conception of the human as a free individual. In short, orthodox theoretical contributions which centre on the distinction between the private and the public are founded on an individualism particular to certain strands of European thought. The public sphere is not an empty space. In doing this, he ably demonstrates the ways in which legal systems and their governance develop in relation to legal developments elsewhere. In Egypt, the developing relationship between religion, law and morality is influenced by its history as a colony of Britain. He decentres the study of the relationship between the religious and the secular, taking the focus away from European trajectories of the secular. Instead, the secular is denaturalised to become a conjunction of historical and geographical circumstances. In the Irish context, where Catholic identity is intimately connected with being Irish, Asad’s approach allows a more profound analysis. This analysis is not based on a story of constant decline and privatisation. It locates religion in some places and not others, always in dialogue, not replacement. This entry was posted in Eoin O'Mahony, Politics and Religion, Religion and Society, Religion and Theory, Theory & Religion Series, Theory and Method and tagged Formations of the Secular, Power, public sphere, secularism, secularization, Talal Asad. Bookmark the permalink. This blogpost is not scholarship, it is a blogpost. My ideological musings are my own and are not meant to represent any particular ‘neo-Marxist teleological historical force’. I was asked to write about a book that has been influential in my thought. As for shoehorning something called Irish Catholicism, that was assessed in November as being appropriately scholarly by a panel of peers. In geography.